In the third week of August 2005 Hurricane Katrina hit the Gulf Coast of the United States killing 1,836 people. A few months later Rebecca and I were working on a project in Mobile, Alabama. We drove along the coast from Mobile to New Orleans and found the devastation still intact: missing towns, washed out bridges, fallen forests, cars filled with mud, memorials. We came upon a grand and battered oak tree that survived the blast of flood waters. It’s branches, like arms and hands, still held the remains of sheets and carpets, clothing and drapery. This weather beaten collection of cloth blew gently in the wind. That moment and that image seemed to sum up so much of an experience for which there were no words. Rebecca and I finished our work in Mobile and returned to Indianapols tending to local projects but we often thought of that tree and what we saw along the Gulf Coast. Rebecca eventually exhibited some of the photographs she had taken on that trip. But that tree was haunting. We often spoke of how we might take the methods and materials of disaster and create something of hope? Over time we found our way to clothes drying racks and construction flagging tape. We called them “trees”. 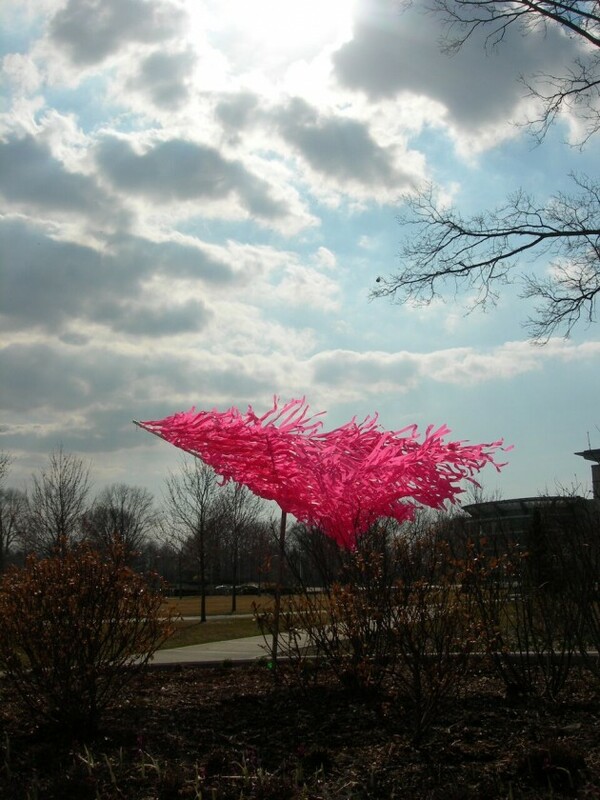 We showed our trees for the first time at the Indianapolis Museum of Art in 2007 for a Spring Equinox event curated by Anne Laker. These trees evolved over time and were seen in other places. But this is one of the first images taken of a TOI Tree. When I look at this image I think of the devastating loss of life and property from Katrina and the rebuilding that continues to this day. I also think of all the intimate losses that many of us face in our lives and the timeless need for hope here today.